Using free moving boxes will not only help you cut moving costs in the long run but it will also make your household move more eco-friendly. If you keep your eyes wide open and do a little research you may come across a lot of ideas on where to get free moving boxes. It’s actually a cost-effective strategy, especially if you are performing a DIY move. 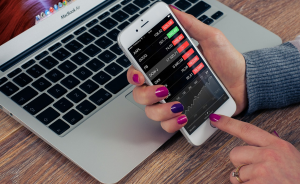 Moving on a limited moving budget requires special measures and you will be glad to know that there are different ways to keep your moving expenses under control. However, even if there are plenty of moving boxes available, you don’t have to assume that you should automatically use them. Moving boxes and packing material should meet certain safety criteria – you need to make sure that they are in good condition and sturdy enough to handle the weight of your belongings. If you decide to hire a NYC moving company, the entire packing process may be taken care of by professionals, which means that you can run your personal errands in the meantime. For example, here at Dumbo moving and storage we both sell and give away moving boxes and supplies depending on the type of agreement with the customers. Professional moving companies provide all sorts of moving boxes and moving supplies, including specialty boxes for some of your treasured and most delicate belongings. plastic moving containers create no additional waste. 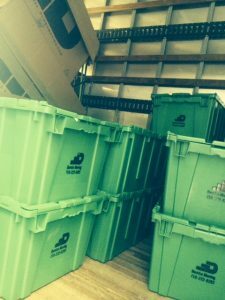 Furthermore, using green moving bins will put your mind at ease since you don’t have to worry about how to dispose of used packing supplies after the move is over. That way you will spare yourself the additional work and headache, since you’ve had enough of it during the whole relocation process. – Sometimes free moving supplies are just a few clicks away, so start searching for what you need on the internet as soon as possible – the earlier you get started, the less stressful the box hunting process will be. – Engage your social network to get free moving boxes by putting out a post asking for free moving boxes. 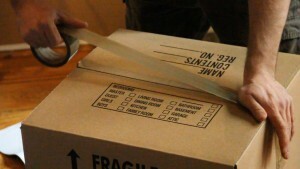 There might be someone who is willing to give away his moving boxes after a successfully completed household move. – Spread the word about the move – ask family, friends, co-workers, your friends’ friends if someone they know has recently moved house. Provided that the boxes are in good condition and functional, this would be the easiest way to get free moving containers. – The first place you want to check out for free cardboard moving boxes are grocery stores, since they get their shipment in cardboard boxes. 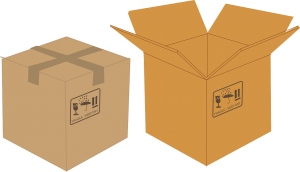 If you can arrange to pick up the boxes when the shipment comes in, you may get a lot of solid boxes that may be put to good use during the upcoming move. If you are not quite sure as to the size of the boxes that would be most suitable, always bare in mind the rule of thumb when it comes to packing – your move may go faster if you have several light boxes rather than a few big heavy boxes. – Check out local bookstores if they are willing to give away some boxes. As it turns out books are very heavy and you need to transport them in appropriate boxes that will hold the weight. – If you are looking for places in your neighborhood that would have boxes, try visiting places that sell shoes like boutiques, since they may have some extra shoe boxes lying around. Shoe boxes are usually smaller than most other cardboard boxes but they still may come in handy during your move for left over stuff you forgot to pack. – Bars, restaurants and liquor stores get shipments frequently, so visiting those places may be worthwhile. – Your office may be a good source of packing supplies. Your managers may be able to spare a couple of boxes and other supplies for you. – Let the nearest pharmacist know that you are seeking boxes and ask him to inform you when the shipment arrives, so that you can get there on time to take them. Standing among the pile of used cardboard boxes is not a pleasant scene and one of the most common concerns when moving house is what to do with all those used boxes once your goods are unloaded from the moving truck and successfully unpacked. First of all, keep in mind that someone else may be needing those boxes, so try to keep them in good condition while unpacking. 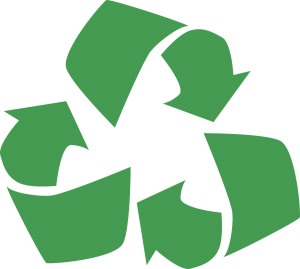 Instead of just throwing them away, contact the local recycling center and ask how you can dispose of them in an eco-friendly manner. The good thing about hiring professional movers is that they will make sure all used boxes and packing supplies are disposed of properly and efficiently. If you can’t find free boxes for moving, we also have green bins to rent.